Most contactless payments happen with something you carry—a smartphone or a contactless credit card. But a swipeable credit card is something you carry, too, so wouldn’t something you wear be much more convenient? Apple Pay is supported on the Apple Watch, and starting this summer, Jawbone’s new UP4 wearable fitness tracker will support contactless payments from American Express. Just wave your wristband at a supported payment terminal, and you’re done. Besides NFC and Amex payments, the UP4 is just like the already-announced UP3, which is available for preorder and will begin to ship after April 20. Both bands are splash-resistant, long-lasting (Jawbone says you can go seven days between charges), and packed with sensors to get a more holistic look at your health, including a reading of your resting heart rate as soon as you wake up each morning. Jawbone also announced an UP2 band to replace its popular UP24—it does everything the UP24 does, only UP2 is slimmer and lighter, and available now for $100. Why this matters: Mobile payments are a fast-growing field. Aside from Apple Pay, Samsung and Google have their own initiatives coming up, and a group of retailers is preparing a system called CurrentC. Each system needs plenty of users, strong security, and lots of places to use it. 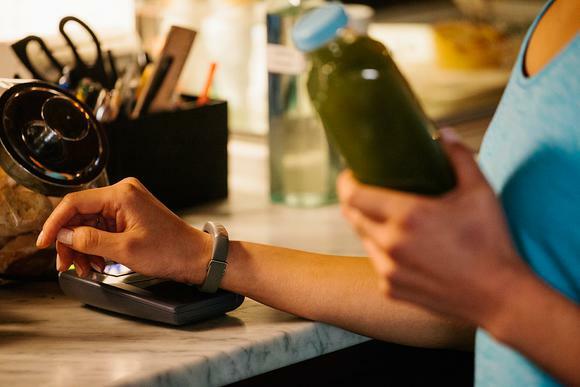 Jawbone’s attempt is restricted to one card—American Express—but Amex already supports contactless payments at big locations like Whole Foods, Peets Coffee and Tea, Best Buy, Office Depot, and Sports Authority. 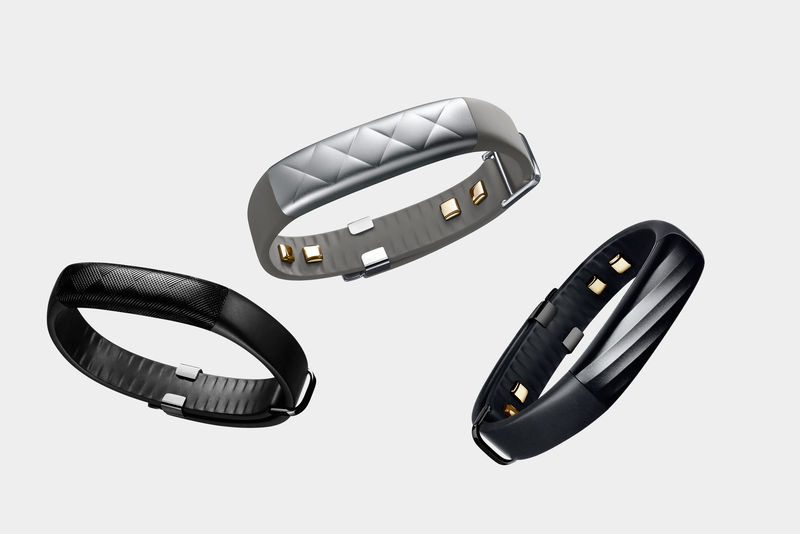 And Jawbone’s $200 UP4 band will work with more phones than Apple Pay or Samsung Pay. Jawbone’s system is designed to offer privacy and security too. Amex provides a token instead of using your real card number to retailers, and Jawbone doesn’t store your credit card number or get any data about your transactions. You get the same consumer protections as you would swiping your plastic Amex card, and if you don’t have a card, you can even apply for one right inside the Jawbone app. Both UP4 and UP3 have four metal contacts that sit against your skin, but your heart rate isn’t tracked all day. Many factors can contribute to spikes in your heart rate, like stress, eating and drinking, and of course our good friend caffeine. Instead, the bands take your resting heart rate (RHR) first thing when you wake up, before you even get out of bed. The UP4 and the UP3 have contacts against your skin to take your resting heart rate. Over time, the data about your RHR is correlated with observations about your sleep patterns and activity levels, so the app can give you actionable advice and suggestions that will coax you toward better heart health overall. For example, if your RHR tends to spike the day after a bad sleep, the app could point this out to you, suggest an earlier bedtime, and remind you to start winding down an hour before. At any point along the way, you can say, “No thanks” to its prompts so it doesn’t nag you when your routine is already thrown off, by, say, a trip or an illness. Actionable tips like this are a much smarter approach to health than just charting your data on graphs and leaving you to make your own connections—that’s how dumber activity-tracking systems get left in a drawer. Looks-wise, UP3 and UP4 are less conspicuous than a smartwatch with a big gaudy screen. While Jawbone’s previous flagship tracker, the UP24, kind of bends around your arm like a pipe but doesn’t close all the way, the new bands have a metal clasp that you can position anywhere on the strap for a very customizable fit. 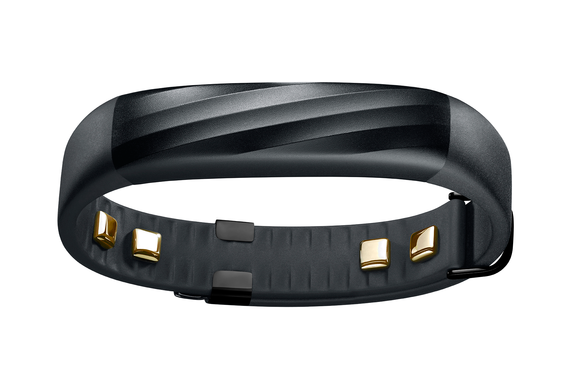 The metal clasps are new to the Jawbone line (the UP2 is shown left, and the UP3 in the center and right). That’s especially important for the UP3 and UP4, whose sensors must stay in contact with your skin, but it helps the new UP2 band stay slim and light as well. It’s only a little tricky to get closed with one hand. (Luckily you don’t have to take it on and off very often, unless you swim every day—these bands are splash resistant but not waterproof.) But the clasp did catch on my long hair twice the first day when I reached up to scratch my head. 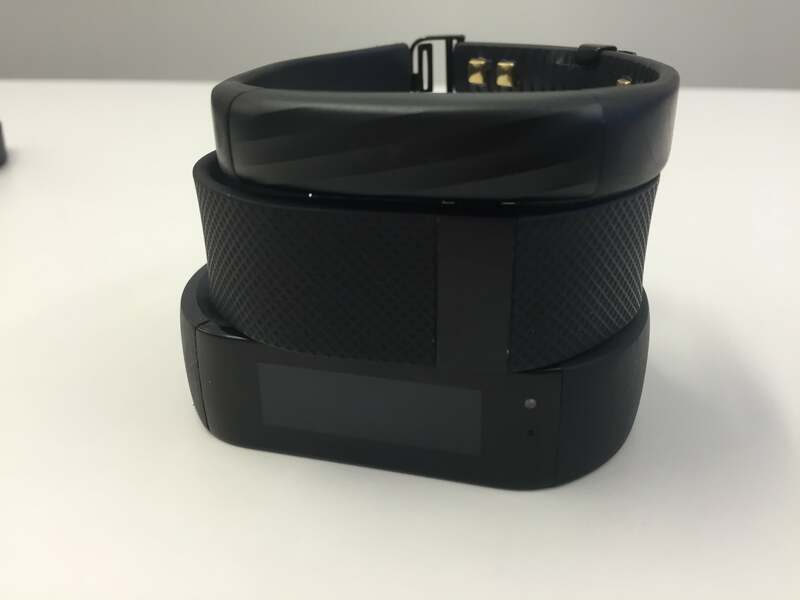 Jawbone’s UP3 (top) is much svelter than the heart-rate-tracking Fitbit Charge HR (middle) or the Microsoft Band (bottom). 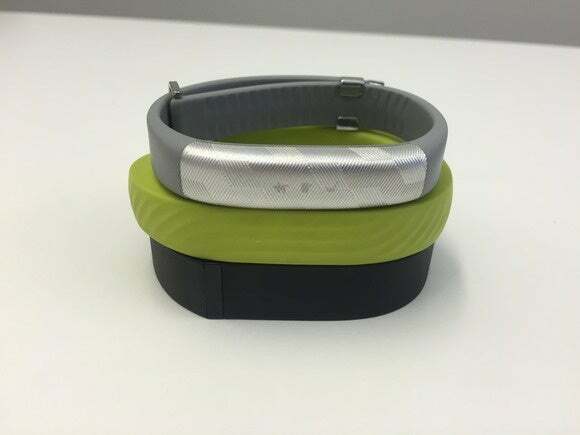 Jawbone’s bands don’t look like jewelry like Misfit’s Shine and Flash, or the Withings Activité, a tracker disguised as a normal wristwatch. But the buttonless, screen-free UP2, UP3, and UP4 are discreet enough to blend in. You can tap the capacitive panel on the top of each band to change modes (asleep and awake), a vibration motor buzzes you when you hit your goal or set an alarm in the app, and you just check the app to view your activity data or get recommendations. The app wasn’t live at the time of this writing (although it is now for iOS and Android), but we’ll have complete reviews later on, after we’ve used each band enough to get meaningful insights into our health. And the UP2 (top, in Light Gray Hex) is slimmer and lighter than its predecessor the UP24 (middle) as well as the Fitbit Flex (bottom). The UP2 is available immediately from Amazon and Jawbone for $100, which is $30 less than Jawbone offered the UP24. A Black Diamond pattern is available first, with a Light Gray Hex option and more colors coming soon. It’ll be on store shelves at Best Buy starting April 19. UP3 is shipping starting April 20 for $180, in a Black Twist pattern. UP4 will be available starting this summer, for $200.